The Lions of Casterly Rock have honored their sigil colors of crimson and gold well, through blood split and wealth gained. Lions of the Rock focuses on the ambitious House Lannister, their vast resources and love of intrigue. It features new cards that include Clansmen, Tywin Lannister, Bronn, and new Lannister-specific, devastating Events. Be careful not to prick a lionâ€™s pride...a Lannister always pays his debts. 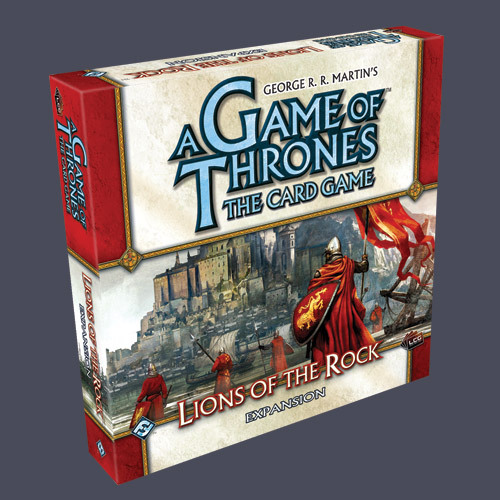 Lions of the Rock is the sixth Deluxe Expansion for A Game of Thrones: The Card Game, featuring 165 cards new to the LCGÂ® card pool â€“ three copies each of 55 unique cards â€“ that add deck-building opportunities and strategic depth to your game. This is not a stand-alone game; an A Game of Thrones: The Card Game Core Set is required to play.